Select the spread by clicking on the top spread bar. Use the Gap slider, located in the Inspector tab on the right, to adjust the gap for the selected spread. Go to the top menu and select Edit > Select All Spreads. 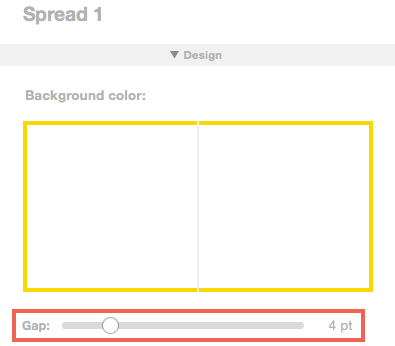 Use the Gap slider to adjust the spacing between the images on all spreads at the same time. Note: Only images that are snapped to the set gap distance will be automatically adjusted via the Gap slider. By default, images are automatically snapped to the set gap that's specified during album setup. This slider will not work on custom templates that contain images which have been moved, or un-snapped, from the set gap. These images will need to be manually adjusted using Designer View.